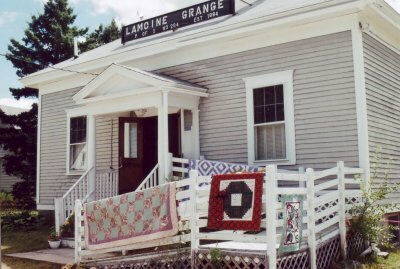 Did you know that the Lamoine Grange is 100 years old this year? The original two story building, erected in 1884, burned in 1916. The new one - the present one story building, was completed by 1918 in the same "foot-print". It is in pretty good shape, considering, but it doesn't take much to realize that a lot of refurbishing is in order, hence - the "Grange Renovation Fund" was established to pay for the upgrades. LCA wishes to publically thank EBS for their generous donation of vinyl siding for Lamoine-Bayside Grange. As many Lamoiners now realize, this 100 year old building now functions as home to both the Grange and Lamoine Community Arts. LCA has assumed responsibility for upgrading the facility as a year round venue for arts activities in our community. We're grateful that EBS has recognized the value of our endeavors. Replacing those old wooden clapboards with new insulation and siding will occur this summer. When you drive by Lamoine Corner, check on the progress being made by LCA volunteers. The building will be in full new attire this coming fall. Machias Savings Bank Elsworth representatives Melissa Strang-Asst. Bank Manager, Leann Beal-Mortgage Specialist, Bobbi-Jo Thorton-Business Banker, and Vicki Hall-Business Banker, Bar Harbor joined Lamoine Commuity Arts and LCA members Kathy McGlinchey, President, Fred Stocking, Treasurer, Carol Korty, Artistic Director, Anne Labossier and Master of the Lamoine-Bayside Grange, Tom St. Claire at the Grange, Lamoine Corner. See additional information regarding this gift below. lst row left to right: Leann Beal, Mortgage Specialist; Bobbi-Jo Thorton, Business Banker; Anne LaBossiere, LCA Board; Melissa Strang, Asst. Bank Manager. 2nd row left to right: Vicki Hall, Business Banker, Fred Stocking, LCA Treasurer; Kathy McGlinchey, LCA President; Carol Korty, LCA Artistic Director; Tom St.Claire, Master, Lamoine Bayside Grange. We are grateful to Bar Harbor Bank and Trust and Machias Savings Bank, who have made donations or are committed to donating to the fund. Thanks to these and other generous gifts from the Community, we will be proceeding with additional upgrades to the exterior of the building in the spring. 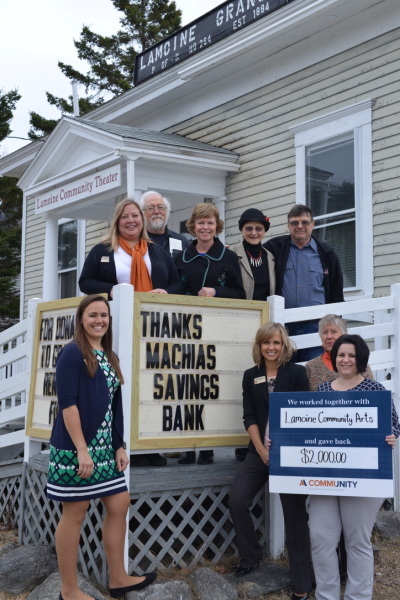 Lamoine-April 19, 2018 - The Machias Savings Bank recently presented LCA with a gift donation of $2,000 to the Grange Renovation Fund. 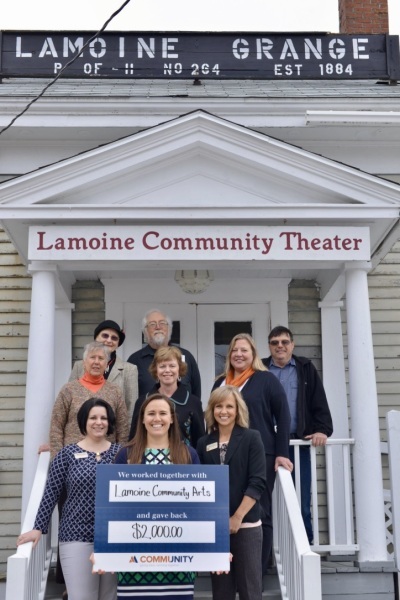 LCA is in the second year of a three year capital improvement campaign to renovate the century old Lamoine-Bayside Grange Hall located on Lamoine Corner. The Grange is LCA's primary venue for its performances and other arts events (music, visual arts and dance.) The arts group has already made the hall suitable for year-round use by insulating and ventilating the building. Theatrical lights have been added and the electrical system has been upgraded. Projects planned for the next phase include constructing an ADA approved entrance ramp, replacing back and side entrances and the installation of an additional lavatory. The donation from Machias Savings Bank will be put towards the financing of these projects. 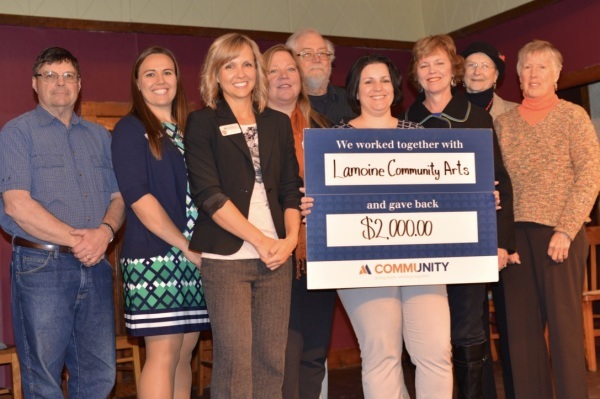 Lamoine Community Arts is a not-for-profit organization of volunteers dedicated to providing opportunities in the performing and visual arts for the enjoyent of Lamoine and surrounding communities. To learn more about LCA visit the website; www.lamoinearts.org or logon to Facebook @Lamoine Community Arts. 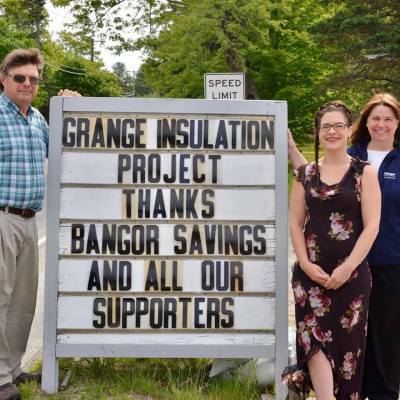 Contributions to the Grange Renovation Fund can be sent to Lamoine Community Arts, 30 Berry Cove Road, Lamoine, ME 04605. Thank you! Lamoine Community Arts is in the process of adjusting to having our venue, the Lamoine Bayside Grange, open year round. We've added several events to complement our spring "Readers' Theater" and full production in the fall. Not all weeks are filled, however, and we'd gladly make the space available to other groups and individuals when possible. Priority will be given to arts events. A few restrictions will apply: a responsible person, over 18 must be in charge, no alcohol or open flame (including cigarettes) are allowed in the building or parking lot, and capacity may not exceed 100 people according to fire code. No fee is charged, although donations towards the upkeep of the building would be appreciated. A deposit of $50 is required to cover cost of post-event clean up. This deposit will be returned if the group prefers to handle clean up themselves.